Not to be confused with Resident Evil Zero. First light novel volume cover featuring Emilia. Re:Zero − Starting Life in Another World (Japanese: Re：ゼロから始める異世界生活, Hepburn: Ri:Zero kara Hajimeru Isekai Seikatsu, lit. 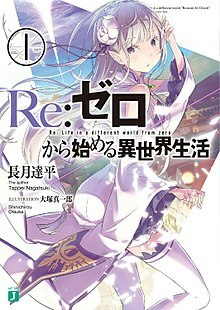 "Re: Starting life in a different world from zero") is a Japanese light novel series written by Tappei Nagatsuki and illustrated by Shinichirou Otsuka. The story centers on Subaru Natsuki, a hikikomori who suddenly finds himself transported to another world on his way home from the convenience store. The series was initially serialized on the website Shōsetsuka ni Narō from 2012 onwards. Seventeen volumes have been published by Media Factory since January 24, 2014, under their MF Bunko J imprint. The series' first three arcs have been adapted into separate manga series. The first, by Daichi Matsue, was published by Media Factory between June 2014 and March 2015. The second, by Makoto Fugetsu, has been published by Square Enix since October 2014. Matsue launched the third adaptation, also published by Media Factory, in May 2015. Additionally, Media Factory has published two anthology manga with stories by different artists. An anime television series adaptation by White Fox aired from April 4, 2016 to September 19, 2016, starting with an hour-long special. The first of two OVA based on the series was released on October 6, 2018, and the second OVA will be released in Q4 2019. In March 2017, game developer 5pb. released a visual novel based on the series. On March 23, 2019, a second season of the series was announced to be in production. The novels and all three manga adaptations are published in North America by Yen Press. The anime adaptation has been licensed by Crunchyroll, which released the anime on home video through Funimation in the United States and Anime Limited in the United Kingdom. The light novels have sold more than three million copies, while the anime series has sold more than 60,000 copies on home video. The light novels have been praised for their fresh take on the "another world" concept, but have been criticized for awkward dialogue and redundancy. The anime series has been praised by critics for its "culturally complex world" and for the actions of its characters. The series received awards at the 2015–2016 Newtype Anime Awards and the 2017 Sugoi Japan Awards, and was nominated for Anime of the Year at The Anime Awards 2016. Subaru Natsuki is a hikikomori who does nothing but play games. One night, after visiting a convenience store, he is suddenly summoned to another world. With no sign of who summoned him, he soon befriends a silver-haired half-elf girl who introduces herself as Satella, and her companion Puck. Satella mentions that her insignia was stolen by a thief named Felt. When he and Satella are mysteriously killed, Subaru awakens and discover that he has acquired the ability "Return by Death", enabling him to reverse time by dying. He greets Satella again, only for her to be offended at being addressed by the name "Satella", which in fact refers to the "Jealous Witch", and is considered a taboo. With the help of Reinhard (a knight) in another timeline, Subaru saves "Satella's" life from the assassin Elsa; she reveals that her real name is Emilia, and as a token of gratitude, Felt returns the insignia to her. While recovering at the margrave Roswaal's mansion, the mage Beatrice drains Subaru's mana. After waking up, he meets the twin maids Ram and Rem, as well as Roswaal, who hires him as a butler. Roswaal reveals that Emilia needed the insignia to qualify as a candidate in the upcoming royal election. After mysteriously dying again, Subaru decides to investigate the circumstances leading to his death, and tries to recreate these events. Following a series of traumatic deaths and revivals, he learns that a curse had been placed on him, then deduces it came from a village he had visited earlier, also resolving Rem's intense hatred for witches. Eventually, the village is threatened by creatures known as mabeasts, so Subaru, Rem and Ram have to rescue the villagers. Later, Emilia is summoned to the capital by two members of the Crusch's Camp, Wilhelm and Felix who is also a part of the Royal Guard for the start of the royal selection. There, Subaru and company meet the other royal candidates: Priscilla, Crusch, Anastasia and Felt; and their knights, Aldebaran, Julius, and Reinhard. Felt initially announces that she will not participate in the election, and Subaru declares himself to be Emilia's knight. 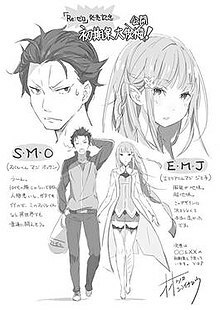 Following a public fight which leaves Subaru badly injured, he gets into a huge argument with Emilia, and she decides to cut ties with Subaru, leaving him behind. After recovering, Subaru decides to train under Wilhelm, while Felix advises him to make up with Emilia. Rem then warns Subaru that something is occurring at the mansion, and against Crusch and Felix's warning, Subaru decides to return to the mansion. There, he discovers many dead bodies, including that of Rem, much to his horror. After dying and respawning, he is ambushed by a wicked group known as the Witch's Cult and meets the insane leader, Petelgeuse, who then tortures and kills Rem. Having later been killed by a monstrous Puck, Subaru respawns and curses Petelgeuse. Knowing that the mansion and village will be attacked, Subaru seeks help from the other royal candidates, but they all decline. While gathering an evacuation, he encounters a legendary mabeast called the White Whale. Rem sacrifices herself to allow Subaru to escape. After returning to the mansion, Subaru encounters Ram and Emilia, who have no recollection of Rem. Disturbed by the situation, Subaru reveals his "Return by Death" ability to Emilia, only for her to die afterward. Puck, enraged, transforms and kills Petelgeuse and his cult, then freezes Subaru to death as punishment for Emilia's death. After respawning, Subaru, having fallen into utter despair, has a serious conversation with Rem, asking her to run away with him. Rem, however, strongly encourages Subaru not to give up and confesses her love for him, already knowing that his heart is for Emilia. With newfound resolve, Subaru then decides that he will start again from zero. Subaru and Rem later battle against the White Whale, after successfully striking an alliance with Crusch's and Anastasia's camps. Following a long and hard-fought battle, Wilhelm ultimately kills the White Whale, thus avenging the death of his wife. Eventually, with the help of his new allies, Subaru is finally able to defeat Petelgeuse and his cult, saving the lives of Emilia and the villagers. Having reconciled with Emilia, Subaru confesses his love for her, leading Emilia to tearfully thank Subaru for saving her. The series' editor at MF Bunko J, Masahito Ikemoto, first became aware of the web novel in April 2013, when it began to appear on his Twitter feed. He was immediately impressed by the series' use of Return by Death, and how it was a "depressing, yet surprising, twist on the fantasy genre", and began working with Nagatsuki to adapt the series into a light novel. Most light novels are around 250 pages in length, but Nagatsuki submitted a manuscript of more than 1,000 pages for the first novel, forcing Ikemoto to edit it heavily. While Nagatsuki wanted to engage in worldbuilding early on, Ikemoto felt that it was more necessary to make the readers feel engaged with the characters. He ended up rearranging the story so that parts focusing on the world and its lore were pushed back to the third arc of the series. Prior to his involvement in Re:Zero, illustrator Shinichirou Otsuka worked on video games, which led him to draw the backgrounds first when illustrating the series. After reading the web novel, he submitted a number of character designs for the major characters to Ikemoto. Subaru's initial design made him look like a delinquent, with Otsuka later describing it as "not the face of a boy in his teens", leading Ikemoto to request that the character be "more friendly and less fierce" so that the audience could empathize with him during emotional scenes. Originally, Emilia's character design appeared extremely plain, so a number of features were added to make her more interesting. Ikemoto specified that she must fit the "archetypal heroine" mold. Rem and Ram also underwent significant changes from the first draft: their original designs lacked the characteristic hair parts, and their maid uniforms were longer and more "traditional". The possibility of an anime adaptation came up early in the development of the series; Sho Tanaka, a producer at Kadokawa, asked Ikemoto about properties which might lend themselves to being animated, and Ikemoto recommended that Tanaka read Nagatsuki's web novels. Despite an initial miscommunication which led to Ikemoto believing that Tanaka wasn't interested, talks of adapting the series began soon after the web novels began the transition to print. As part of talks for the potential anime adaptation, Ikemoto and Tanaka spoke to Tsunaki Yoshikawa, an animation producer at studio White Fox, about the possibility of his studio animating the series. Hoping to adapt the series into an anime similar to Steins;Gate (which White Fox also produced), and having a positive impression of the studio as one that did faithful adaptations, Tanaka then formally approached them about producing the show. White Fox's president contacted Yoshikawa for his opinion, and Yoshikawa recommended they accept, as long as the series "doesn't violate any broadcasting regulations". Production on the anime began sometime after the release of the fifth novel in October 2014. Masaharu Watanabe was chosen by Yoshikawa to direct the series because he had previously worked for the studio doing key animation, while Kyuta Sakai was picked to be the series' character designer and animation director because Yoshikawa felt that she would be able to do justice to the novel's art and also maintain the series animation quality over 25 episodes. Masahiro Yokotani was brought on board to compose the anime, his first time working on a "reborn in another world"-type story. Yoshikawa warned him about the violence in the series, but he was still surprised by the violent and disturbing scenes in novels three and beyond, having only read the first novel when he agreed to work on the project; he delegated the writing of those episodes in the second cour to the other two scriptwriters. Yoshiko Nakamura joined the project sometime after Masahiro had completed the script for episode 3. When it proved unfeasible for Yokotani and Nakamura to write the scripts alone, the decision was made to bring another scriptwriter on board. Gaku Iwasa, the president of White Fox, asked them to hire someone "younger", leading Yokotani to suggest Eiji Umehara. Nagatsuki had recently been playing Chaos;Child, which Umehara had written for, and he approved the choice, suggesting that they let Umehara write the "painful parts"; Umehara was invited to join the project around the time that the scripts for episodes 8 and 9 were being written. Re:Zero was the first light novel adaptation that either of the screenwriters had worked on. After joining the project, both Nakamura and Umehara had to adjust their views of the main character, and were forced to rewrite scenes where they had made Subaru appear "cool". At Watanabe's direction, Nakamura was made to rewrite Subaru's telling of The Red Ogre Who Cried in episode 6 multiple times. The staff also had difficulty deciding on a song to use for Subaru's ringtone that plays during the closing scene of episode 19, considering songs like "Kanpaku Sengen", "The Beard Song", and "M" by Princess Princess, before settling on "Yoake no Michi" from Dog of Flanders. While choosing a composer to produce the series' music, director Watanabe wanted to choose someone who had "hit a nerve" with him. A fan of drama series, Watanabe was struck by a piece of music in the medical drama Death's Organ, and found that the series' composer, Suehiro Kenichirō, had also worked on a number of his favorite anime and drama series. After Suehiro was attached to the production, Watanabe gave him three major guidelines: use human voices during the Return by Death sequences; compose the music like he would for a drama or a movie to capture the emotional scenes; and "pull all the stops" for the suspenseful scenes. Additionally, for the first cour, Watanabe asked for music with a "suspenseful" vibe, while requesting music with a "romantic" feel for the second cour. Both Watanabe and Suehiro are fans of Italian composer Ennio Morricone, and Suehiro tried to take inspiration from his works while composing the soundtrack. Watanabe also requested that there be songs that mimicked Hans Zimmer's score from The Dark Knight. While Suehiro used music that wasn't very "anime-ish" during most of the series, he was asked to use more traditional anime music during the slice of life scenes. A number of times during the series, such as in episodes 7 and 15, Watanabe made it a point to use an entire song, something which is unusual in most anime. The series makes limited use of its opening and ending themes, and Watanabe has said that he wished he could use them more frequently. The Re:Zero web novel was initially serialized by Tappei Nagatsuki (writing under the username Nezumi-iro Neko (鼠色猫, "Mouse-Colored Cat")) on the user-generated content site Shōsetsuka ni Narō from April 20, 2012 onwards. As of January 4, 2019[update], six novels and two side stories have been published, comprising a total of 476 chapters. Following the web novel's publication, Media Factory acquired the series for print publication. The first light novel volume, with illustrations by Shinichirou Otsuka, was published on January 24, 2014, under their MF Bunko J imprint. As of March 2019, nineteen volumes have been published, as well as three side story volumes and four short story collections. Nagatsuki and Otsuka began publishing a series of short side-stories focusing on characters from the series in Monthly Comic Alive, starting with the character Elsa in August 2016. It was followed with one focused on Petra Leyte on November 26, 2016, and one featuring Ram and Rem on January 27, 2016. The light novels are published in English by Yen Press, who announced their acquisition of the license via Twitter on December 2, 2015. The publisher has also acquired the license to the Re:Zero EX side novels. A manga adaptation by Daichi Matsue, titled Re:ZERO: -Starting Life in Another World- Chapter 1: A Day in the Capital (Ｒｅ：ゼロから始める異世界生活 第一章 王都の一日編, Re: Zero Kara Hajimeru Isekai Seikatsu Dai-Ichi-Shō: Ōto no Ichinichi-hen), began serialization in the August 2014 issue of Media Factory's seinen manga magazine Monthly Comic Alive on June 27, 2014. The final volume was released on March 23, 2015. On December 2, 2015, Yen Press announced that they had licensed the series. A second manga, titled Re:Zero -Starting Life in Another World-, Chapter 2: One Week at the Mansion (Re：ゼロから始める異世界生活 第二章 屋敷の一週間編, Re: Zero Kara Hajimeru Isekai Seikatsu Dai-Ni-Shō: Yashiki no Ishūkan-hen), with art by Makoto Fugetsu, began serialization in Square Enix's seinen magazine Monthly Big Gangan on October 25, 2014. The final chapter was published on December 24, 2016, and an extra chapter was published on January 25, 2017. The second adaptation has also been licensed by Yen Press. Daichi Matsue began serializing a third manga, Re:Zero -Starting Life in Another World-, Chapter 3: Truth of Zero (Re:ゼロから始める異世界生活 第三章 Truth of Zero, Re: Zero Kara Hajimeru Isekai Seikatsu Dai-San-Shō: Truth of Zero) in Comic Alive's July 2015 issue on May 27, 2015. Yen will publish the third adaptation as well. A manga anthology, titled Re:Zero -Starting Life in Another World- Official Anthology Comic (Re:ゼロから始める異世界生活　公式アンソロジーコミック, Re:Zero kara Hajimeru Isekai Seikatsu Kōshiki Ansorojī Komikku), was published by Media Factory on June 23, 2016. A second anthology was published on September 23, 2017. An Internet radio show to promote the series named "Re: Radio life in a different world from zero" (Re：ゼロから始める異世界ラジオ生活) began broadcasting on March 27, 2016. The show was aired every Monday and was hosted by Rie Takahashi, the voice actress for Emilia. Guests that appeared on the show included Yūsuke Kobayashi (Subaru Natsuki), Inori Minase (Rem), Yumi Uchiyama (Puck), Rie Murakawa (Ram), Satomi Arai (Beatrice), Chinatsu Akasaki (Felt), Kana Ueda (Anastasia Hoshin), and Yui Horie (Felix). The show ran for 33 episodes and concluded on December 19, 2016. The first radio CD, which contains episodes 1–8 of the show, was released on June 27, 2016. The second, which contains episodes 9–16 of the show, was released on September 28, 2016. The third, containing episodes 17–24, was released on November 30, 2016, and the fourth, containing episodes 25–33, was released on March 29, 2017. An anime television series adaptation was announced by Kadokawa in July 2015. The series is directed by Masaharu Watanabe and written by Masahiro Yokotani, with animation by the studio White Fox. Kyuta Sakai is serving as both character designer and as chief animation director. Music for the series is composed by Kenichiro Suehiro. Kentaro Minegishi is the series' director of photography, and Yoshito Takamine serves as art director. Jin Aketagawa handled sound direction for the anime, and sound effects were produced by Yuji Furuya. Other staff members include Hitomi Sudo (editing), Yu Karube (3D director), Saaya Kinjō (art configuration), Izumi Sakamoto (color design), and Noritaka Suzuki and Gōichi Iwabatake (prop design). The 25-episode series premiered on April 4, 2016,[b] with an extended 50-minute first episode. It was broadcast on TV Tokyo, TV Osaka, TV Aichi, and AT-X. The series was simulcast by Crunchyroll. Episode 18 ran 2 minutes longer than a typical anime episode, clocking at 25 minutes and 45 seconds. The final episode ran 4 minutes longer, clocking at 27 minutes and 15 seconds. A series of anime shorts featuring chibi versions of the characters, titled Re:Zero ~Starting Break Time From Zero~ (Re:ゼロから始める休憩時間(ブレイクタイム), Re:Zero kara Hajimeru Break Time), were produced by Studio Puyukai to accompany the series. The shorts ran for eleven episodes before being replaced by a new series of shorts, titled Re:PETIT ~Starting Life in Another World from PETIT~ (Re:プチから始める異世界生活, Re:Puchi kara Hajimeru Isekai Seikatsu), which began airing on June 24, 2016 and ran for 14 episodes. [c] The shorts are directed, written, and produced by Minoru Ashina, with character designs by Minoru Takehara, who also animated the series alongside Sumi Kimoto and Chisato Totsuka. Kenichiro Suehiro reprised his role as composer for the shorts, while Tomoji Furuya of Suwara Pro produced the sound effects. Jin Aketagawa directed the sound at production company Magic Capsule. The shorts aired on AT-X after each episode of the regular series, starting on April 8, 2016. Crunchyroll acquired the streaming rights to both shorts. An original video animation (OVA) episode was announced at the "MF Bunko J Summer School Festival 2017" event on September 10, 2017. All of the main staff and cast returned for the OVA, with Tatsuya Koyanagi joining as chief director. Titled Memory Snow, the OVA was screened in Japanese theaters starting on October 6, 2018. A second OVA, titled Hyōketsu no Kizuna (氷結の絆, "Frozen Bonds"), was announced on September 23, 2018. The OVA will be an adaptation of the prequel novel Re:Zero Kara Hajimeru Zenjitsu-tan: Hyōketsu no Kizuna (Re:ゼロから始める前日譚 氷結の絆) which was included with the first Japanese Blu-ray release of the television series, and focused on the meeting of Emilia and Puck. It will be released in Japanese theaters in Q4 2019. The series is licensed by Crunchyroll in the United States; Funimation announced during their Katsucon 2018 panel that they will release it on home video with an English dub as part of the two companies' partnership. Crunchyroll also holds the license in the United Kingdom, where the series is distributed by Anime Limited. Both Funimation and Anime Limited's Season 1 Part 1 Blu-ray releases received negative attention after it was discovered that they showed visible color banding and compression artifacts. The Season 1 Part 2 Blu-ray was released on February 5, 2019. On March 23, 2019, it was announced that a second season is in production. The cast will reprise their roles for the second season. The first opening theme song was "Redo" by Konomi Suzuki, and the first ending theme was "Styx Helix" by Myth & Roid, while for episode 7 the ending theme was "Straight Bet", also by Myth & Roid. The second opening theme song, titled "Paradisus-Paradoxum", was performed by Myth & Roid, while the second ending theme, "Stay Alive", was performed by Rie Takahashi. Myth & Roid also performed ending theme for episode 14 titled "theater D". The series' soundtrack was released on CD on October 26, 2016. The disk contains 21 tracks composed by Kenichiro Suehiro. "Redo", Suzuki's 10th single, was released on CD on May 11, 2016. The single was also released as a limited edition with a DVD featuring a music video, a live concert video, and a "making of" video. The songs were performed by Suzuki, with lyrics by Genki Mizuno and arrangement by Makoto Miyazaki. The CD for "STYX HELIX", the series' first ending theme, was Myth & Roid's 3rd single. Written, arranged, and performed by the group, it was released on May 25, 2016, and included both regular and instrumental versions of "STYX HELIX" and "STRAIGHT BET". "Stay Alive", the second ending theme, was released as a single on August 24, 2016. The songs were performed by Takahashi (Emilia) and Minase (Rem). The songs were written and arranged by Heart’s Cry. Myth & Roid released the second opening theme as a single on August 24, 2016. The CD included regular and instrumental versions of "Paradisus-Paradoxum" and "theater D". For Memory Snow, three pieces of theme music were used: the ending theme "Memory Memory Snow" and the image song "Relive" by Nonoc, and the insert song "Memories" by Riko Azuna. In August 2016, game developer 5pb. announced that they were developing a visual novel based on the series, titled Re:Zero -Starting Life in Another World- Death or Kiss (Re:ゼロから始める異世界生活 -DEATH OR KISS-, Re:Zero kara Hajimeru Isekai Seikatsu -Death or Kiss-). The game follows an original story that differs from the light novel and the anime, and allows the player to choose between routes featuring Emilia, Rem, Ram, Felt, Beatrice, Crusch, Priscilla, or Anastasia. A DLC will allow players who pre-ordered the game to replace the character's costumes with swimsuits. The opening theme, "yell! magic starts with a kiss" (yell！～くちびるからはじまる魔法～, Yell!~ Kuchibiru kara Hajimaru Mahō ~), was performed by Suzuki, who sung the anime's first opening theme, while the ending theme, "Dai Dai Daisuki" (ダイ・ダイ・ダイスキ), was performed by Minase and Murakawa. In Japan, the game was originally scheduled to be released for PlayStation 4 and PlayStation Vita on March 23, 2017, but was delayed to March 30, 2017, due to certain circumstances. The limited edition of the game came with a soundtrack CD and either a Ram (for the PS4 version) or Rem (for the PSVita version) SD figure. A virtual reality app that allows the user to interact with the character Rem was released for iOS and Android on May 26, 2017. A version featuring the character Emilia was released on June 6, 2017. The game was later ported to both PC and to the PlayStation VR. According to Japanese light novel news website LN News, the series had 1 million copies in print as of June 2016, over 2 million as of September 2016 and over 3.1 million as of May 2017. The light novel series was the tenth best-selling light novel series in Japan between November 2015 and May 2016, selling 263,357 copies. During that period, the first and second volumes were the 35th and 48th best-selling light novel volumes, selling 49,194 and 41,617 copies, respectively. The series was the fourth best-selling series in 2016, selling 1,007,381 copies between November 2015 and November 2016. Its first three volumes were the 14th, 21st, and 30th best selling volumes of the year, selling 155,363, 127,970, and 110,574 copies, respectively. In 2017, the series was the third best-selling series, with 925,671 copies sold. Its 1st, 10th, 11th, and 12th volumes respectively ranking 19th (60,135 copies), 25th (56,001 copies), 7th (101,480 copies), and 12th (79,431 copies) in the period between November 2016 and May 2017. The series was the 21st best selling anime series on home video during 2016, selling approximately 68,791 Blu-ray and DVD sets. Theron Martin of Anime News Network reviewed the first book, praising it for being a somewhat fresher take on the "transported to another world" concept, but leveled criticism at it for bumpy and awkwardly timed dialogue and a tendency for redundancy. The series ranked number one in a poll of 820 people conducted by the Japanese website Anime! Anime! to determine the best show of spring 2016. Andy Hanley from UK Anime Network considered the anime adaptation as one of 2016's best series. The Managing Editor from Anime Now!, Richard Eisenbeis lists the anime as one of his top picks from 2016 for its "culturally complex" world and characters that have "their own plans, faults, and motivations". He praised Subaru as the "most complex character of the year" due to provoking the audience to "cheer him and despise him" in a world that portrayed him as the "least special person in it". The series took second place in the 2015–2016 Newtype Anime Awards. Additionally, director Masaharu Watanabe took first place, as did Subaru, Rem, and Puck (in the best male, female, and mascot character categories, respectively). Masahiro Yokotani's screenplay took second place, while the series' character designs (by Shinichirou Otsuka and Kyuta Sakai) took third place. The series' soundtrack and second opening theme both took fourth place in their categories. The light novels and the anime both took first place in their respective categories in the 2017 Sugoi Japan Awards. In a survey of (primarily female) Otamart users, the series was ranked second on a list of the most successful anime/manga/light novel franchises of 2016. Re:Zero was nominated for "Anime of the Year" in Crunchyroll's The Anime Awards 2016, and was also the service's most-watched series of 2016, topping Yuri on Ice. ^ The episode, which was released on September 19, 2016, included material from the ninth novel, which was released four days later on September 23, 2016. ^ The series is listed to have premiered on April 3 at 25:35, which is the same as April 4 at 1:35. ^ The shorts are aired every Friday after the main episode on AT-X, and then streamed online four days later. ^ "Re:ZERO -Starting Life in Another World-, Vol. 1 (light novel)". Yen Press. Retrieved August 5, 2018. ^ "ファン必見!! 大人気の異世界転移系アニメ"リゼロ"と"このすば"がコラボレーション!!". ddnavi.com (in Japanese). January 30, 2018. Retrieved August 8, 2018. ^ Chapman, Jacob (August 20, 2016). "Subaru Natsuki: The Best and Worst Thing About Re:Zero". Anime News Network. Retrieved August 5, 2018. ^ "Animax Asia to Air Re:ZERO -Starting Life in Another World- Anime in January". Anime News Network. December 23, 2016. Retrieved December 24, 2016. ^ a b c d e f g h i j Luster, Joseph (July 17, 2016). "FEATURE: "Re:ZERO" All-Night Marathon and Staff Discussion – What Makes Subaru Tick (Everyone Off)". Crunchyroll. Retrieved August 17, 2016. ^ a b c d e f g h i Jack, Er Gin (June 26, 2016). "FEATURE: "Re:ZERO" All-Night Screening Event!". Crunchyroll. Retrieved August 17, 2016. ^ a b c d Luster, Joseph (August 13, 2016). "FEATURE: "Re:ZERO" Director and Composer Discuss Who The True Heroine Is: Emilia or Rem?". Crunchyroll. Retrieved August 18, 2016. ^ Nagatsuki, Tappei (July 2016). Re:ZERO -Starting Life in Another World- Volume 1. Yen Press. p. 233. ISBN 978-0-316-31530-2. ^ "Ｒｅ：ゼロから始める異世界生活5" [Re:Zero -Starting Life in Another World- 5]. Media Factory (in Japanese). Retrieved August 18, 2016. ^ a b c d e f g h i j Luster, Joseph (September 17, 2016). "FEATURE: The Scriptwriters of "Re:ZERO" Episodes 15 and 16 Discuss What Happened Behind the Scenes". Crunchyroll. Retrieved September 20, 2016. ^ "Ｒｅ：ゼロから始める異世界生活「ただそれだけの物語」" [Re:Zero -Starting Life in Another World-: "That's All This Story Is About"]. TV Tokyo (in Japanese). Retrieved September 20, 2016. ^ "Re：ゼロから始める異世界生活 9". Media Factory (in Japanese). Retrieved September 20, 2016. ^ Green, Scott (September 12, 2016). ""Re:Zero" Anime Overtakes Published Light Novel Material (Spoiler Warning)". Crunchyroll. Retrieved September 12, 2016. ^ Rezero_official (September 11, 2016). "文庫「Ｒｅ：ゼロから始める異世界生活９」の口絵イラストがこちら！　あれ、この状況、台詞、見覚えがあるような……。つまり――現在TVアニメが原作文庫を追い抜いています。ということで来週放送の第25話はまだ原作文庫でも未公開の内容！". Twitter (in Japanese). Archived from the original on September 12, 2016. Retrieved September 11, 2016. ^ a b c d e f g Luster, Joseph (July 31, 2016). "FEATURE: "Re:ZERO" Director and Composer Discuss Their Fixation on Theatrical Music". Crunchyroll. Retrieved August 18, 2016. ^ Nagatsuki, Tappei (July 2016). "Afterword". Re:ZERO -Starting Life in Another World- Volume 1. Yen Press. pp. 229–231. ISBN 978-0-316-31530-2. ^ a b Komatsu, Mikikazu (March 21, 2016). ""Re: Zero kara Hajimeru Isekai Seikatsu" TV Anime One Hour Premiere Set for April 3". Crunchyroll. Retrieved June 27, 2016. ^ a b "Ｒｅ：ゼロから始める異世界生活". Shōsetsuka ni Narō (in Japanese). Retrieved October 5, 2017. ^ Green, Scott (August 27, 2016). "Smell The Entrails As Elsa "Bowel Hunter" Granhirte Gets Her Own "Re:Zero" Side Story". Crunchyroll. Retrieved August 27, 2016. ^ a b Green, Scott (December 26, 2016). ""Comic Alive" To Offer New "Re:Zero" Rem & Ram Side Story Along With "Together With Rem – Night" Poster". Crunchyroll. Retrieved December 27, 2016. ^ Green, Scott (November 12, 2016). "Petra Gets Her Own "Re:ZERO" Side Story". Crunchyroll. Retrieved November 13, 2016. ^ a b c d e f "Yen Press Licenses Asterisk War, Re:Zero Manga, Light Novels". Anime News Network. December 2, 2015. Retrieved December 2, 2015. ^ "Yen Press Licenses Re:Zero EX Spinoff Novels". Anime News Network. May 16, 2017. Retrieved June 30, 2017. ^ "「のんのんびより」特製Tシャツ、アライブ8周年で販売" [Non Non Biyori special T-shirt sold at Alive's 8th anniversary]. Natalie (in Japanese). June 27, 2014. Retrieved May 23, 2016. ^ "月刊『ビッグガンガン』2014 Vol.11 10月25日(土)発売" [Monthly Big Gangan 2014 Vol. 11 October 25 (Saturday) release]. Square Enix (in Japanese). Retrieved May 23, 2016. ^ "月刊 ビッグガンガン 2014年 vol.11 2014年 11/23号 [雑誌]" [Monthly Big Gangan 2014 vol.11 2014/11/23 edition [magazine]]. Rakuten (in Japanese). Retrieved May 23, 2016. ^ Fugetsu, Makoto (December 23, 2016). "本日発売のビッグガンガンに「Re:ゼロから始める異世界生活 第二章」最終話「未来の話」掲載されております。これにて二章完！お待たせしました、この続きはマツセ先生の三章で！大好きなリゼロに漫画という形で関わらせて頂けて幸せでした。ありがとうございます！". Twitter (in Japanese). Retrieved March 24, 2017. ^ "017年 Vol.01 最新号情報 | ビッグガンガン" (in Japanese). Square Enix. Retrieved March 26, 2017. ^ Fugetsu, Makoto (January 24, 2017). "本日ビッグガンガン発売日！リゼロ二章本編は先月最終回で今回は特別編。「第一次マヨネーズ騒動」です。思い返せばリゼロの連載が決まり、はじめて長月先生にお会いした時に「マヨ回描かせて下さい！」と頼み込んだ思い出。レムのこの笑顔が描きたかったんだ。#rezero　#リゼロ". Twitter (in Japanese). Retrieved March 24, 2017. ^ Green, Scott (January 25, 2017). ""Re:Zero" Manga Adapts Special Mayonnaise Chapter". Crunchyroll. Retrieved March 24, 2017. ^ "2017年 Vol.02 最新号情報 | ビッグガンガン" (in Japanese). Square Enix. Retrieved March 26, 2017. ^ "Re:ZERO -Starting Life in Another World-, Vol. 1 (manga)". Hachette Book Group. Archived from the original on January 4, 2017. Retrieved December 31, 2016. ^ "「ノーゲーム・ノーライフ・です！」アライブで獣人種いづな描いたスピンオフ". Natalie (in Japanese). May 27, 2015. Retrieved May 23, 2016. ^ "アニメ放送中の「Re:ゼロから始める異世界生活」川上真樹表紙のアンソロ". Natalie (in Japanese). June 23, 2016. Retrieved September 1, 2016. ^ "Re:ゼロから始める異世界生活 公式アンソロジーコミック Vol.2". Media Factory (in Japanese). Retrieved March 20, 2018. ^ a b "Re：ゼロから始める異世界ラジオ生活". Onsen (in Japanese). Retrieved August 27, 2016. ^ "Re:ゼロから始める異世界ラジオ生活 第１回". Nicovideo (in Japanese). Retrieved August 27, 2016. ^ a b "Radio CD, Vol. 1". Re:Zero kara Hajimeru Isekai Seikatsu (official site) (in Japanese). Archived from the original on October 24, 2016. Retrieved August 27, 2016. ^ a b "Radio CD, Vol. 2". Re:Zero kara Hajimeru Isekai Seikatsu (official site) (in Japanese). Archived from the original on October 24, 2016. Retrieved August 27, 2016. ^ "Re:ゼロから始める異世界ラジオ生活 results". Nicovideo (in Japanese). Retrieved August 27, 2016. ^ "Radio CD, Vol. 3". Re:Zero kara Hajimeru Isekai Seikatsu (official site) (in Japanese). Archived from the original on October 24, 2016. Retrieved January 20, 2018. ^ "Radio CD, Vol. 4". Re:Zero kara Hajimeru Isekai Seikatsu (official site) (in Japanese). Archived from the original on October 24, 2016. Retrieved January 20, 2018. ^ "Re: Life in a different world from zero Light Novels Get TV Anime Adaptation". Anime News Network. July 19, 2015. Retrieved July 19, 2015. ^ "Re: Life in a different world from zero Anime's Cast, Staff, April Premiere Revealed". Anime News Network. December 18, 2015. Retrieved March 22, 2016. ^ a b "STAFF&CAST". Re-zero-anime.jp (in Japanese). Archived from the original on October 28, 2016. Retrieved August 25, 2016. ^ Komatsu, Mikikazu (March 21, 2016). ""Re: Zero kara Hajimeru Isekai Seikatsu" TV Anime One Hour Premiere Set for April 3". Crunchyroll. Retrieved March 22, 2016. ^ "Re:ZERO -Starting Life in Another World- Anime Listed With 25 Episodes". Anime News Network. April 4, 2016. Retrieved April 4, 2016. ^ "Crunchyroll to Stream Re:ZERO -Starting Life in Another World- Anime". Anime News Network. March 22, 2016. Retrieved March 22, 2016. ^ Green, Scott (July 25, 2016). "A Standard-Length Episode Couldn't Contain All "Re:ZERO" 18 Has To Offer". Crunchyroll. Retrieved July 27, 2016. ^ a b c "Re:Zero -Starting Life in Another World- Anime Gets SD Spinoff Shorts". Anime News Network. April 7, 2016. Retrieved April 7, 2016. ^ "ミニアニメ「Re:ゼロから始める休憩時間(ブレイクタイム)」放送決定！". Studio Puyukai (official site) (in Japanese). Retrieved May 24, 2016. ^ "ミニアニメ「Re:プチから始める異世界生活」第1話公開！". Re:Zero kara Hajimeru Isekai (official anime site) (in Japanese). June 28, 2016. Retrieved July 5, 2016. ^ "Crunchyroll Adds 2 Series of Re:Zero Anime Shorts". Anime News Network. July 23, 2016. Retrieved July 23, 2016. ^ "Re:Zero Anime's New Episode Revealed in Promo Video". Anime News Network. September 10, 2017. Retrieved September 11, 2017. ^ Hodgkins, Crystalyn (July 29, 2018). "Re:Zero Memory of Snow OVA's 2nd Key Visual, Returning Staff Revealed". Anime News Network. Retrieved July 29, 2018. ^ "Re:Zero OVA's Visual, Japanese Theatrical Release Revealed". Anime News Network. March 8, 2018. Retrieved March 8, 2018. ^ "Re:Zero OVA Reveals Subtitle, Visual, Fall 2018 Theatrical Release". Anime News Network. March 19, 2018. Retrieved March 19, 2018. ^ Loo, Egan (June 20, 2018). "Re:Zero Orignal Video Anime Slated for October 6 Screenings". Anime News Network. Retrieved June 20, 2018. ^ Hodgkins, Crystalyn (September 23, 2018). "Re:Zero Anime Gets 2nd OVA Episode About Emilia, Pack's 1st Meeting". Anime News Network. Retrieved September 23, 2018. ^ Sherman, Jennifer (March 21, 2019). "Re:Zero Anime's 2nd OVA Project Slated to Debut in Theaters This Fall". Anime News Network. Retrieved March 21, 2019. ^ "Funimation Announces Re:Zero Home Video Release". Anime News Network. February 18, 2018. Retrieved February 18, 2018. ^ "Funimation Announces Re:Zero Anime's English Dub Cast". Anime News Network. Retrieved 2018-03-04. ^ Saabedra, Humberto (March 15, 2018). "Check Out The June 2018 Crunchyroll/Funimation Home Video Release Slate, Now Available For Pre-Order!". Crunchyroll. Retrieved March 15, 2018. ^ "Anime Limited Updates from London MCM Comic Con". Anime News Network. May 28, 2016. Retrieved May 28, 2016. ^ NormanicGrav (December 24, 2017). "Anime Limited News: New Podcast Episode, Update on Stock, Xmas Sales Updates". Anime UK News. Retrieved June 22, 2018. ^ Ressler, Karen (June 22, 2018). "Re:Zero's Western Blu-rays Show Color Banding Artifacts, Companies Respond". Anime News Network. Retrieved June 22, 2018. ^ Funimation. "Re:ZERO - Starting Life in Another World - Season One Part Two - BD/DVD Combo". www.funimation.com. Retrieved 2018-11-15. ^ KADOKAWAanime (March 23, 2019). "『Re:ゼロから始める異世界生活』TVアニメーション《第2期》製作決定". YouTube. Retrieved March 23, 2019. ^ Pineda, Rafael Antonio (March 23, 2019). "Re:Zero Anime's Video Reveals 2nd TV Anime Season". Anime News Network. Retrieved March 23, 2019. ^ "Re: Life in a different world from zero Anime's Theme Songs, Character Designs Revealed". Anime News Network. February 25, 2016. Retrieved March 22, 2016. ^ Rezero_official (May 21, 2016). "第7話の最後に流れた挿入歌は、MYTH & ROIDの『STRAIGHT BET』です！ 5月25日発売のEDテーマ『STYX HELIX』のCW曲ですよ。". Twitter. Retrieved August 25, 2016. ^ "MYTH&ROID, Rie Takahashi Perform Re:Zero Anime's New Theme Songs". Anime News Network. June 11, 2016. Retrieved June 11, 2016. ^ "MYTH & ROID「Re:ゼロから始める異世界生活」の新OPテーマをYouTube公開" [MYTH & ROID launch the new OP theme for "Re:Zero -Starting Life in Another World-" on YouTube]. Natalie. July 6, 2016. Retrieved August 25, 2016. ^ a b "サウンドトラックCD" [Soundtrack CD]. Re-zero-anime.jp (in Japanese). Archived from the original on October 29, 2016. Retrieved August 25, 2016. ^ "TVアニメ「Re：ゼロから始める異世界生活」オープニングテーマ「Redo」【通常盤】" [TV anime "Re:Zero -Starting Life in Another World-" opening theme "Redo" [Regular Edition]]. Media Factory. Retrieved August 25, 2016. ^ "TVアニメ「Re：ゼロから始める異世界生活」オープニングテーマ「Redo」【初回限定盤】" [TV anime "Re:Zero -Starting Life in Another World-" opening theme "Redo" [First Press Limited Edition]]. Media Factory. Retrieved August 25, 2016. ^ a b "オープニングテーマ 鈴木このみ　10thシングル「Redo」" [Opening theme: Konomi Suzuki's 10th single "Redo"]. Re-zero-anime.jp (in Japanese). Archived from the original on October 29, 2016. Retrieved August 25, 2016. ^ "TVアニメ「Re：ゼロから始める異世界生活」エンディングテーマ「STYX HELIX」" [TV anime "Re:Zero -Starting Life in Another World-" ending theme "STYX HELIX"]. Media Factory (in Japanese). Retrieved August 25, 2016. ^ "エンディングテーマ MYTH & ROID　3rdシングル「STYX HELIX」" [Ending theme: MYTH & ROID's 3rd single "STYX HELIX"]. Re-zero-anime.jp (in Japanese). Archived from the original on October 29, 2016. Retrieved August 25, 2016. ^ a b c "第2クール エンディングテーマ エミリア(CV：高橋李依)　「Stay Alive」" [Second cour ending theme: Emilia (CV: Rie Takahashi) "Stay Alive"]. Re-zero-anime.jp (in Japanese). Archived from the original on October 29, 2016. Retrieved August 25, 2016. ^ "第2クール オープニングテーマ MYTH ＆ ROID　「Paradisus-Paradoxum」" [Second cour opening theme: MYTH & ROID "Paradisus-Paradoxum"]. Re-zero-anime.jp (in Japanese). Archived from the original on October 29, 2016. Retrieved August 25, 2016. ^ "『Re:ゼロから始める異世界生活 Memory Snow』イメージソング＆EDテーマはnonocさん、挿入歌は安月名莉子さんが担当！　アーティスト情報公開" (in Japanese). Animate. October 6, 2018. Retrieved March 23, 2019. ^ a b "OVA「Re:ゼロから始める異世界生活 Memory Snow」Memory Album" [OVA "Re:Zero − Starting Life in Another World Memory Snow" Memory Album]. Re-zero-anime.jp (in Japanese). Retrieved March 23, 2019. ^ "5pb. Games Develops Re:Zero Video Game". Anime News Network. August 25, 2016. Retrieved August 25, 2016. ^ Luster, Joseph (August 25, 2016). "5pb. Reveals "Re:ZERO" Visual Novel Plans". Crunchyroll. Retrieved August 25, 2016. ^ a b Green, Scott (August 27, 2016). "Rem, Ram and Emilia Put On Swimsuits For "Re:ZERO – Kiss or Death" Visual Novel's Original Story". Crunchyroll. Retrieved August 27, 2016. ^ "Re:Zero PS4/Vita Game's Story Details, Screenshots Unveiled". Anime News Network. August 31, 2016. Retrieved August 31, 2016. ^ a b Luster, Joseph (October 11, 2016). ""Re:ZERO" Game's Limited Edition Contents Make You Choose Between Rem & Ram". Crunchyroll. Retrieved October 11, 2016. ^ Dennison, Kara (December 19, 2016). "Limited-Edition Swimsuit DLC and Goods Announced for "Re:Zero" Early Adopters". Crunchyroll. Retrieved December 20, 2016. ^ Green, Scott (October 21, 2016). "Anison Singer Konomi Suzuki And Rem & Ram Voice Actresses Return For "Re:Zero -Death or Kiss" Visual Novel Themes". Crunchyroll. Retrieved October 21, 2016. ^ "Re:Zero Game Slated for March 23 for PS4, PS Vita". Anime News Network. August 30, 2016. Retrieved August 30, 2016. ^ "Re:Zero -Death or Kiss- PS4/Vita Game Delayed 1 Week to March 30". Anime News Network. February 28, 2017. Retrieved February 28, 2017. ^ Whalen, Amanda (April 5, 2017). "Re:Zero VR App Lets You Sleep in Rem's Lap". Anime News Network. Retrieved May 25, 2018. ^ Pineda, Rafael Antonio (May 28, 2017). "Re:Zero VR App Gets Emilia Version on June 6". Anime News Network. Retrieved May 25, 2018. ^ Luster, Joseph (May 25, 2018). ""Re:ZERO" VR Game Launches on PSVR in Japan". Crunchyroll. Retrieved May 25, 2018. ^ Sherman, Jennifer (October 20, 2017). "Re:Zero VR Apps Gets PC, PSVR Ports". Anime News Network. Retrieved August 8, 2018. ^ Green, Scott (October 3, 2016). "Fans To Be Schooled By "Re:zeropedia" Book". Crunchyroll. Retrieved October 3, 2016. ^ Green, Scott (December 8, 2016). ""Re:Zero" Continues To Prepare For Comiket With Official Fan Book Cover Preview". Crunchyroll. Retrieved December 24, 2016. ^ Green, Scott (November 27, 2016). ""Re:ZERO" And "Konosuba" Creators Meet In Crossover Book". Crunchyroll. Retrieved December 24, 2016. ^ Komatsu, Mikikazu (December 23, 2016). ""Re:ZERO" and "Konosuba" Heroines Change Their Costumes on Collaboration Book Cover". Crunchyroll. Retrieved December 24, 2016. ^ "Re:ゼロから始める異世界生活 ファンブック" [Re:Zero -Starting Life in Another World- Fan Book]. Media Factory (in Japanese). Retrieved December 31, 2016. ^ "Re:Zero Novels Have 1 Million Copies in Print". Anime News Network. June 11, 2016. Retrieved June 12, 2016. ^ Hodgkins, Crystalyn (September 19, 2016). "Re: Zero Novel Ad: 'TV Anime's Sequel' is in the Novels". Anime News Network. Retrieved September 19, 2016. ^ Komatsu, Mikikazu (May 25, 2017). ""Re:Zero" Novel Illustrator's 1st Art Book is Set for Release on September 23". Crunchyroll. Retrieved June 8, 2018. ^ "Top-Selling Light Novels in Japan by Series: 2016 (First Half)". Anime News Network. May 29, 2016. Retrieved June 27, 2016. ^ "Top-Selling Light Novels in Japan by Volume: 2016 (First Half)". Anime News Network. May 29, 2016. Retrieved June 27, 2016. ^ "Top-Selling Light Novels in Japan by Series: 2016". Anime News Network. November 30, 2016. Retrieved December 8, 2016. ^ "Top-Selling Light Novels in Japan by Volume: 2016". Anime News Network. November 30, 2016. Retrieved December 8, 2016. ^ "Top-Selling Light Novels in Japan by Series: 2017". Anime News Network. December 6, 2017. Retrieved December 6, 2017. ^ "Top-Selling Light Novels in Japan by Volume: 2017 (First Half)". Anime News Network. June 1, 2017. Retrieved December 6, 2017. ^ "Top-Selling Animation in Japan on Blu-ray Disc/DVD by Series: 2016". Anime News Network. December 28, 2016. Retrieved December 31, 2016. ^ Theron Martin (August 4, 2016). "Re:ZERO Novel 1 – Review". Anime News Network. Retrieved August 4, 2016. ^ Whalen, Amanda (July 5, 2016). "Japanese Poll Ranks Re:Zero Best Anime of Spring 2016". Anime News Network. Retrieved July 7, 2016. ^ Hanley, Andy. "Time looping and character building – why Re:Zero is 2016's biggest hit". UK Anime Network. Retrieved July 20, 2016. ^ Eisenbeis, Richard (January 1, 2017). "The Best Anime of 2016". Anime Now. Archived from the original on March 5, 2017. Retrieved April 4, 2017. ^ "Shinkai's 'your name.,' Kabaneri Win Top Newtype Anime Awards". Anime News Network. October 9, 2016. Retrieved October 9, 2016. ^ Chapman, Paul (March 16, 2017). ""Re:ZERO" Conquers Two Categories in the SUGOI JAPAN Award 2017 Competition". Crunchyroll. Retrieved March 19, 2017. ^ Komatsu, Mikikazu (November 16, 2016). "Otamart Research: Japanese Fans Pick "Osomatsu-san" as The Most Successful Otaku Franchise of 2016". Crunchyroll. Retrieved November 18, 2016. ^ "ANIME OF THE YEAR". Crunchyroll. Archived from the original on December 22, 2016. Retrieved December 23, 2016. ^ Frank, Allegra (December 29, 2016). "Crunchyroll's biggest anime of the year isn't the obvious choice". Polygon. Retrieved December 31, 2016. ^ Victorino, Corazon (December 29, 2016). "'Yuri On Ice' Loses To 'Re:Zero' In Crunchyroll's Most Popular Anime Of 2016 List". International Business Times. Retrieved December 31, 2016. Wikimedia Commons has media related to Re:Zero -Starting Life in Another World-. I Couldn't Become a Hero, So I Reluctantly Decided to Get a Job. Imōto Sae Ireba Ii. Gaiden: Imōto ni Saenareba Ii!